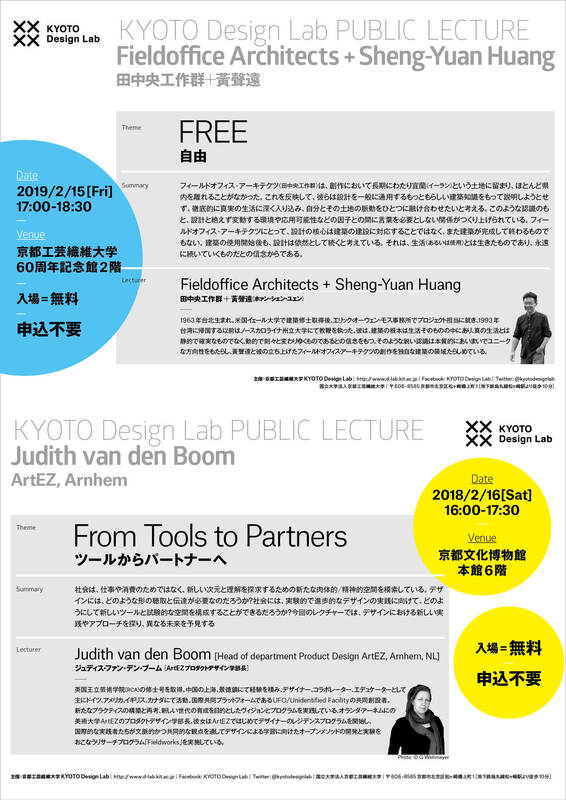 KYOTO Design Lab [D-lab] will hold public lectures by Fieldoffice Architects and Judith van den Boom at Kyoto Institute of Technology Graduate Exhibition 2019. 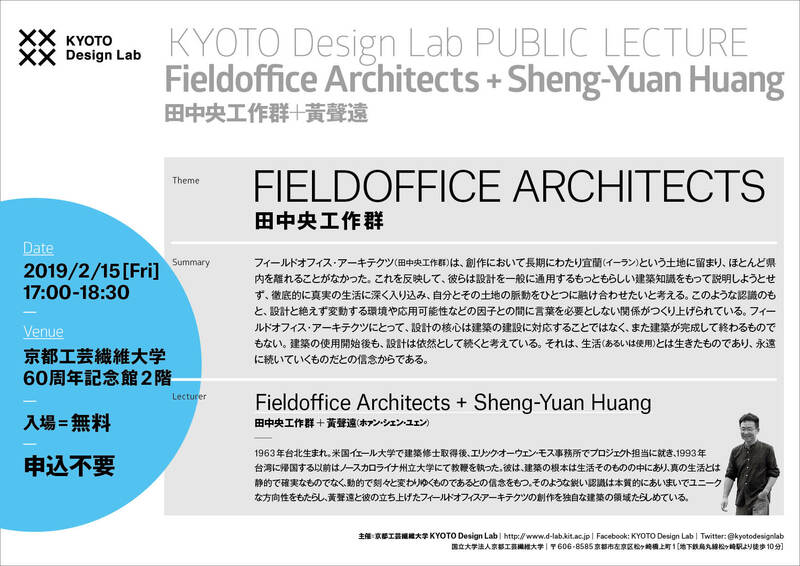 As reflected in their creations, the long-term establishment of Fieldoffice in Yilan and with their design seldom straying from the county, all of which illustrate their intention to not execute architecture with the seemingly plausible and common knowledge. Instead, they wish to integrate themselves with the pulse of the local by living a life that is absolutely genuine and thorough. It is through these perceptions that intimate relationships are formed, without the need for words, between design and factors such as the constantly changing environment and applicability. 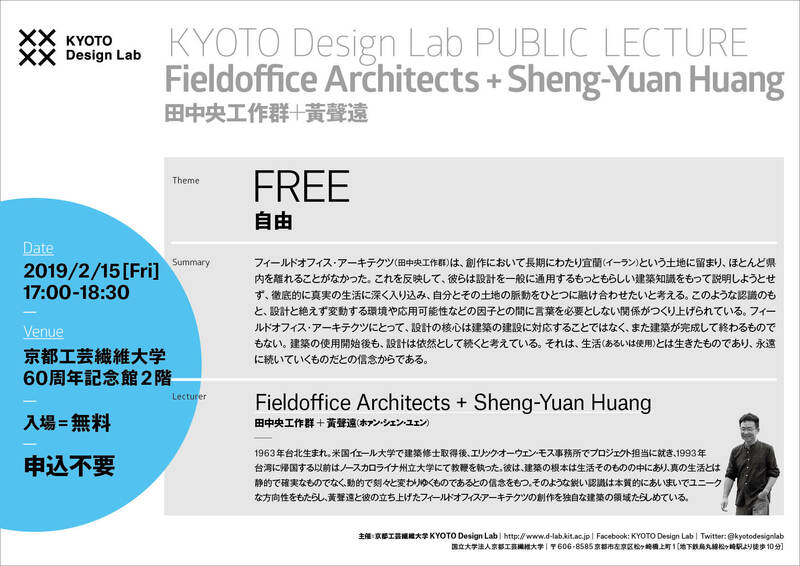 For Fieldoffice, the core of design does not correspond to architectural construction, and does not end after it is completed. They believe that when the architecture is in use, design is still in progress because life (or application) is a live concept, and is forever in a progressive form. Sheng-Yuan Huang, born in Taipei in 1963, holds a master’s degree in architecture from Yale University in the United States. In the early days he worked in Eric Owen Moss Architects as a Project Associate, and taught at North Carolina State University before returning to Taiwan in 1993. Society is searching for new physical and mental spaces that are neither used for work or consumption but explore a new dimensionality and understanding. What forms of listening and transmission are required in design and how can we configure new tools and test-spaces towards experimental and forward-thinking design practices in society? This lecture will explore emerging practices and approaches in design, foreseeing a different future. 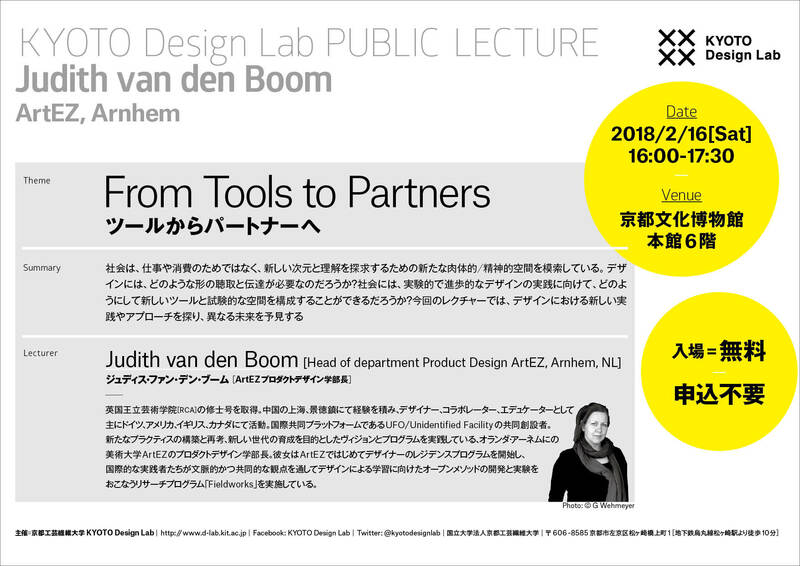 Judith van den Boom’s methods of research, design and her projects are inspired by her practical idealist approach. She seeks new forms of making, listening, collaborating – exploring a more (in)tangible role for design – creating new foundations in the rapidly changing landscape we live and work in. She is currently head of the Product Design department at ArtEZ Institute of the Arts, Arnhem (NL) implementing a new vision and program which aims to build a new generation that rethinks and builds new practices. Judith initiated the first ArtEZ Designer residency where international practitioners participate in the Fieldworks research program, experimenting and developing open methods towards learning by design through a contextual and collaborative perspective. Judith received her MA at the Royal College of Art (RCA) and works as a designer, collaborator and educator. She has exhibited and worked in Germany, the US, the UK, Canada and has spent extensive periods of her practice in Shanghai and Jingdezhen, China. Judith is co-founder of UFO/Unidentified Facility, an international collaboratory platform and is currently pursuing her PhD at Manchester Metropolitan University, UK. Supported by Sogo Shikaku Co., Ltd.